OK, the kids are grown and out of the house. You have been empty-nesters for quite a while and retirement is just around the corner. You home is too large with 2nd floor and basement steps becoming harder to maneuver. It’s time to sell the over-sized house and get into something smaller, something more manageable, something that has fewer steps. At Final Word Home Inspection Service we understand this dilemma and want to help those who are now on a fixed income. 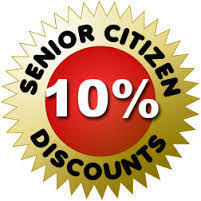 We are offering a 10% discount for retires. If you are retired and purchasing a home, please let us know so we can apply this discount to you.